The Super Scout 2014 NFL Draft Hot 100 Century Club! There are Three Football Players that I am really proud of that were Drafted on Thursday or Friday in this NFL Draft and they all played for LSU. WR Odell Beckham, Jr was Drafted on Thursday by the New York Giants as their #1 Draft Pick and #12 Overall; while RB Jeremy Hill and WR Jarvis Landry #80 (In Photo) were both Drafted on Friday in the Second Round. Odell Beckham, Jr was one of my MVP’s at my 2010 Super Elite Top Gun Camp as he continued to make One-Handed Catches after another; while Hill was also Outstanding at the Super Elite Top Gun Camp. We really had some great Top Gun Coaches. The WR Coach for Beckham was Former All-Pro and Florida All-American WR Wes Chandler. I told all of my players in my Welcome Speech: “You are going to be able to “Hang-Out” with some of the Greatest Coaches on the Planet, but are you going to impress my Coaches and are we going to remember you in Three or Four Years.” I would have to say that we all will remember Odell Beckham and Jeremy Hill forever. Both Landry and Hill (In Photo) tried out for my 2010 Super South 7on7 Team. Landry made the Team and was our Most Outstanding Receiver on the Team that Qualified for the Badger Sports Final Championship Tournament in Tuscaloosa, Alabama. I will never forget Landry making numerous unbelievable catches in that first practice. I was standing right by him when a pass was thrown behind him and he reached back and made a one-handed catch. We were going to take Hill to play Linebacker, but he decided not to play, and went to our Top Gun Camp instead. I will remember that catch by Landry forever. I feel very Blessed to have been able to walk through the lives of these Young Men who became absolutely Great Football Players and are destined for even more Greatness. Not very many Football Scouts on the Planet will ever get the opportunity that I was given to be a part of their lives. Hill was Drafted #2 and #55 Overall by the Cincinnati Bengals and Landry was Drafted #2 and #63 Overall by the Miami Dolphins. I also stepped into the lives of a few other Players who were Drafted on Friday and another couple on Saturday. Both DE Kareem Martin of North Carolina (In Photo) was Drafted #3 by the Cards and OG Trai Turner of LSU was Drafted #3 by the Panthers and they had talked to me on the phone about playing in my All-American Bowl Game, but both got later offers to play in other games, along with Beckham, who played in the U.S. Army All-American Bowl Game and Landry who played in the Under-Armour Game. I also talked to Prince Shembo, David Yankey, and one of A.J. McCarron’s Coaches about them playing in my Game. I could have easily had Beckham, Landry, Martin, McCarron, Shembo, Yankey, and Turner in one of my All-American Bowl Games. I still like several Quarterbacks for Friday or Saturday, including Derek Carr of Fresno State; Jimmy Garoppolo of Eastern Illinois; Tom Savage of Pittsburgh; Zach Mettenberger of LSU; and A.J. McCarron of Alabama, for either Friday or Saturday. Carr will be Drafted Early on Friday in the Second Round. I really like Carr (In Photo) and I also think that Mettenberger has a lot of raw Potential and will become one of the Big Surprises in this Draft. I also believe that McCarron will become a Super Star. After Round One, there were some great Defensive Ends, going into Day Two, including Kody Ealy of Missouri (In Photo); Kareem Martin of North Carolina; DeMarcus Lawrence of Boise State; Scott Crichton of Oregon State; Will Clarke of West Virginia; Trent Murphy of Stanford; James Gayle of Virginia Tech; and Jackson Jeffcoat of Texas. All of these Defensive Ends joined Clowney with outstanding Measurables. There were also some really great Defensive Linemen in RaShede Hageman of Minnesota; Tim Jernigan of Florida State; Ego Ferguson of LSU; Jay Bromley of Syracuse; and Louis Nix of Notre Dame. DT Khyri Thornton of Southern Miss and DT Caraun Reid of Princeton recorded some incredible Measurables. Everyone knew that there was not a single Running Back Selected on the First Day of the NFL Draft, but Jeremy Hill of LSU; Carlos Hyde of Ohio State; and Bishop Sankey were Selected in Round Two; while Tre Mason of Auburn ; Charles Sims of West Virginia; Dri Archer of Kent State; Terrence West of Towson; and Jerrick McKinnon of Georgia Southern were Selected in Round Three. Andre Williams of Boston College; Devonta Freeman of FSU; Kadeem Carey of Arizona; James White of Wisconsin; and Lashe Seastrunk of Baylor will probably get their call on Saturday. I might add that Henry Josey of Missouri; Williams and Seastrunk recorded some pretty incredible Measurables. 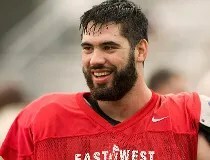 In the Sixth Round of the 2014 NFL Draft, the Kansas City Chiefs made a very Special Selection when they Drafted a very Talented Offensive Lineman from Canada named Laurent Duvernay-Tardif. He ran a 4.93 Forty while weighing 314 pounds and he then went to the Weight Room and Bench Pressed 225-Pounds a total of 34 times. 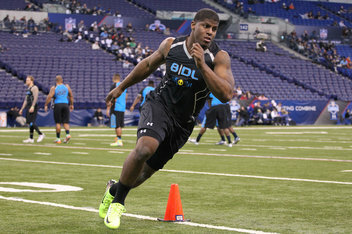 This Canadian is strong, quick, and athletic and he is obviously a Super Combine Freak. His 2,214 MEARS Ranks just behind Greg Robinson with a 2,279 MEARS; Taylor Lewan with a 2,258 MEARS; and Jake Matthews with a 2,242 MEARS. Since all three of those Offensive Linemen were Drafted in the First Round, do you think that the Chiefs got a Steal, by getting Duvernay-Tardif in the Sixth Round? SUPER SCOUT 2014 NFL DRAFT TOP 100 CENTURY CLUB!